Thanks to a late push, Iowa football ended with a solid 2017 recruiting class. It was a long and crazy road, but Iowa football ended National Signing Day with 22 signees and the 41st ranked class in the nation. It’s the Hawkeyes highest final ranking since 2012 when they finished 40th in the nation with players such as Jaleel Johnson, C.J. Beathard and other future starters. Iowa also landed their first five-star recruit in defensive end A.J. Epenesa since offensive lineman Dan Doering in 2005, per 247Sports. As one could assume about any five-star, Epenesa could have gone anywhere. The Edwardsville, Ill., product had offers from Alabama, Oklahoma, Florida State, and many other top programs. It’s a big deal that he stuck with Iowa the whole recruiting process and never showed any signs of wavering. It says a lot about his character, team-first attitude and how committed he is to the program. As many have said, “Epenesa is a five-star talent with a two-star attitude.” That’s the type of player you want leading your program. Plus, four-star offensive lineman Tristan Wirfs signed with the Hawkeyes to give them their first set of four/five-star recruits since 2012, a year after they had none. Mark Kallenberger received four stars from Scout but only three from 247Sports. Either way, Iowa’s future as Offensive Line-U looks promising a year after winning the Joe Moore Award. Although, many will associate this class, at least for the time being, as a what if story. What if the Hawkeyes could have kept prized four-star running back Eno Benjamin. What if they didn’t have a string of their prized Texas recruits, which included Benjamin, Gavin Holmes, Chevin Calloway and Beau Corrales, decommit one after another. 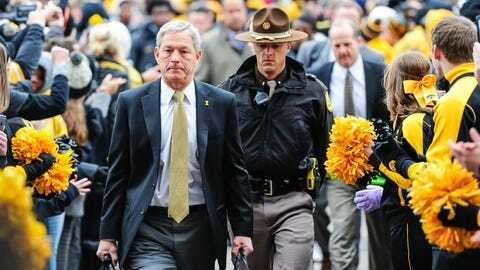 The Hawkeyes would have two more four-star recruits, two more three-star recruits and potentially a top 20 recruiting class, an unprecedented feat under Kirk Ferentz. The Hawkeyes, just like any team, could have benefitted from more talented players, but it’s also not the end of the world. Iowa football has long been built on three-star recruits and walk-ons. Josey Jewell, LeShun Daniels Jr, Matt VandeBerg and Akrum Wadley are just a couple of former two and three recruits that will anchor the Hawkeyes in 2017. It’s a testament to recruiting coordinator Kelvin Bell and Iowa’s coaching staff in being able to find hidden talent. Iowa’s late surge, concluding on National Signing Day, helped give them one of their most promising recruiting class in years, even if it was mostly compiled of three-star recruits. They found a punter in Ryan Gersonde to replace Ron Coluzzi, convinced Geno Stone to switch from Kent State to Iowa, landed a versatile linebacker in Nate Wieland and signed defensive end Daviyon Nixon and wide receiver Ihmir Smith-Marsette in the final days. It turned a respectable recruiting class into the eighth best in the Big Ten. It’s the first time since 2011-12 that Iowa finished with back-to-back top 10 recruiting classes in the conference, not to mention the Hawkeyes also being the only team other than Ohio State and Michigan to sign a five-star recruit. The Hawkeyes continued to recruit their way, and it worked out well this year. They have a lot of underrated talent, such as cornerback Trey Creamer and wide receiver Brandon Smith, that have a chance to contribute right away, especially in a new-look offense under Brian Ferentz. Most importantly, Iowa recruited well in-state. Sure, their Texas pipeline fell through, even if they still managed to sign quarterback Peyton Mansell and cornerback Matt Hankins, but Iowa recruited well in Iowa. The Hawkeyes missed on top ranked Oliver Martin, who committed to Michigan, but signed six of the state’s top 20, including the second and third ranked players. This is the time to be excited about recruiting classes. Every team thinks they found a hidden gem and their highly touted recruits will be the next Heisman winner. That said, a year after Iowa failed to land a four-star recruit and finished 47th nationally, the Hawkeyes faced challenges but still managed to finish with an above-average class in respect to how they usually recruit. Their 12-0 2015 season and respectable 8-4 2016 season seemingly helped. Plus, if Peyton Mansell’s excitement on Twitter is any indication, Swarm 17 could be one of Ferentz’s best.